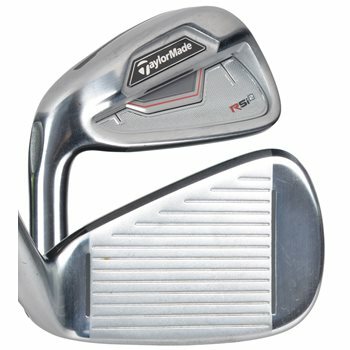 The TaylorMade RSi 2 iron set features Face Slot Technology (3-8 irons). This technology takes the Speed Pocket Technology to the next level. With face slots located near the toe and heel of the club it allows for uniform flex of the face. It also has improved Speed Pocket Technology (3-7 irons). The result is more consistent distance on off-center hits and increased launch angle and ball speed on all shots. This set also features progressive multi-material construction with LONG IRONS: Tungsten low in the toe for higher launch and more ball speed; MID IRONS: High-strength, thin-face steel construction for high speed and consistency; SHORT IRONS: Forged carbon steel face with milled grooves for soft feel and control; WEDGE: Fully forged 1025 carbon steel wedge for optimum feel and precision. Best iron set I played with. Review by Abul, 2 years ago. Review by PJ, 1 year ago. Review by Bill, 2 years ago. Review by Golf 50, 2 years ago. I missed the 15 percent off taylormade used clubs earlier this week. Any chance of getting that promo today? If you use the coupon code 'newt', it will apply a 15% discount on an order over $100. I didn't understand the answer to my first question. Is there any way to see actual pictures of clubs to reference condition of Very Good? Unfortunately, due to our large inventory, we are unable to send actual photos of the clubs listed. All clubs are given a condition grade and accurately described for what to expect on the condition description of the website. We apologize for any inconvenience.